Are you looking for window options that can bring a touch of class to your residential or commercial property? If you are, look no further than Clear View, where we provide the best range of aluminium windows Chesterfield has to offer. To find out more about our range of aluminium windows, please call us today on 0800 1357167. When you are looking for a company that provides aluminium windows in Chesterfield, you want to be sure you are employing the premier company in the industry. By choosing Clear View for all your window needs, that is exactly what you can expect to receive. Our range of aluminium windows can bring a touch of class to any property, whether that is residential or commercial. Aluminium windows from us are manufactured to the same high standards as our folding and sliding doors. With our aluminium windows, Chesterfield clients can expect the perfect balance between aesthetic beauty and reliability. These windows offer all the benefits that a quality window system should offer, including superb insulation, minimal maintenance, and outstanding security. Aluminium windows in Chesterfield from our team at Clear View come made to measure, meaning we can design and manufacture window systems for all requirements. Whether you require fixed windows, casement windows, sash windows, tilt and turn windows, angled windows, or bay windows, we have you covered. Our expert CAD technicians work alongside our specialist window surveyors and can design and produce window systems for a completely bespoke solution. Using thermally broken aluminium frames, our window systems are designed to prevent the loss of heat from the inside of a room. In summer, this effect is reversed, keeping your rooms cool. Bi-folding doors are a multi-folding door that creates a 90% clear opening, giving you complete open access to your garden outside. Typically, these open in a concertina style and neatly fold flat when open, either on the interior or exterior. As with our aluminium windows, Chesterfield clients can expect a range of benefits from our bi-folding doors. The materials we use are strong, light weight, and versatile, which makes them ideal for use on bi-fold doors. They are also extremely durable, which is why we are able to offer a 10-year guarantee on all our folding door systems. 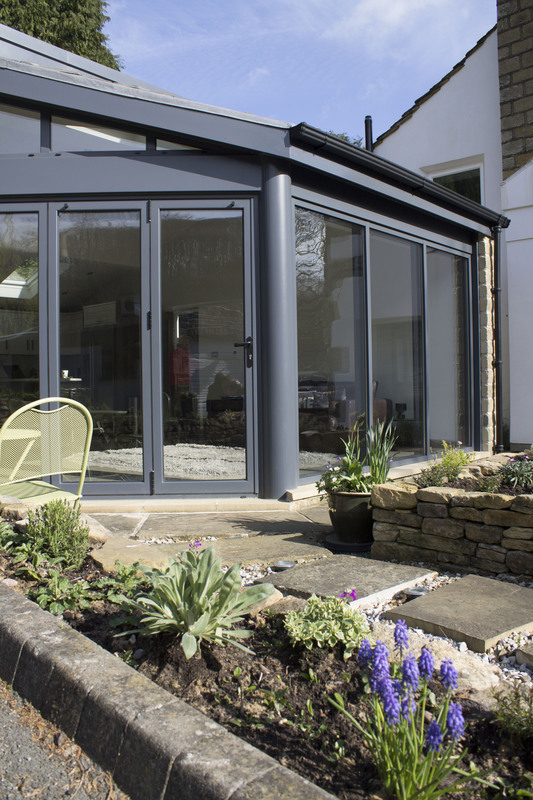 We manufacture a beautiful range of aluminium sliding doors that offer our clients the perfect alternative to folding, patio, or French doors. 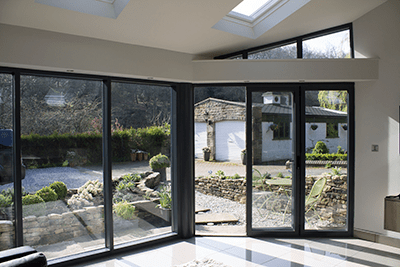 This option is different to bi-folding doors due to its ability to completely open up a room or property. A single sliding door can be constructed to a width and height of 3.0m, which provides fantastic uninterrupted views of the scene beyond. Clients who had had aluminium sliding doors installed have commented that it feels like they have a sliding glass wall rather than a door. Additionally, due to having less vertical panels, a sliding door also delivers more light into the building. At Clear View, our sliding patio doors and bi-folding patio doors can transform both the look of your home and the way you live your life. Whether you want to feel you’re bringing the outside in, or you aspire to have a panoramic view from your room, our beautiful aluminium doors will achieve the perfect result. The aesthetics of our patio doors will add a touch of finesse to any external aspect of your home and, when closed, will complement your home with a striking glass façade. Manufactured to provide strength and durability, the aluminium profiles deliver a structurally sound product that requires minimal maintenance. We supply a beautiful range of contemporary and traditional aluminium front doors. Whether you’re buying our doors as an individual item or as part of a package, our doors will complement any home. 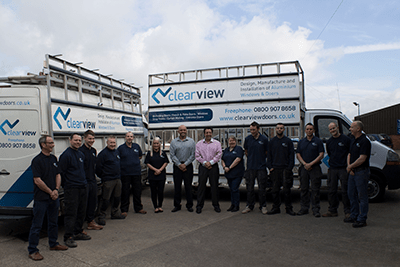 At Clear View, we can supply and install a diverse range of styles, colours, glass designs, and insulation levels to suit your requirements. When you choose Clear View to provide your aluminium windows in Chesterfield, you can rest assured knowing you are employing the premier windows and doors company in the industry. We have 10 years of experience in providing our clients with the highest quality products and highly qualified engineers to install your products. When you purchase our aluminium windows, Chesterfield clients can have complete peace of mind knowing that we are fully insured. Additionally, we offer guarantees on all of our products, ensuring that if the worst does happen, you are covered. All of our Chesterfield aluminium doors are manufactured in house. This means that we can personally keep an eye on the quality levels throughout manufacture, ensuring you only receive the best product. In addition to the above information, we provide all of our clients with a free online quote. This means that, when you come to us for aluminium windows, Chesterfield clients have nothing to lose by enquiring about our services. To find out more about the best aluminium windows Chesterfield has to offer, please contact us today on 0800 1357167. Alternatively, you can email us at sale@clearviewdoors.co.uk or fill out our online form and we will respond quickly and efficiently to your enquiry.